A man in a black wool overcoat stood at an ATM in the lobby of a bank on Broadway. A black and white Shetland collie sat at his right foot. It was after 1 a.m. The man withdrew $100, put the money in a trifold wallet, and returned the wallet to the inside breast pocket of his tuxedo. The man snapped his thumb and middle finger. The dog, ever alert to his master’s movements, walked out of the bank lobby, his head even with the man’s right knee. Man and dog walked two blocks down Broadway to a produce market. The man purchased a Gala apple and a Bosc pear. The store clerk, a sullen man, put the purchases in a small plastic bag. The man ignored the clerk. —Every night the same. Next time, no dog in store. The man turned and left the store, the dog heeled next to his right knee. The man and dog continued down Broadway. Near the corner of 79th Street, the man stopped. In the window of a women’s boutique, stood five naked, bald mannequins. A lithe, athletic woman, early thirties, was dressing the mannequins. The window display lights were not on. The only light was a bare bulb in a clamp lamp attached to the back of a metal folding chair. The store specialized in women’s dance and exercise wear. It was called Femme Nikki. Man and dog watched as the window-dresser removed an exercise garment from her body and put it on a mannequin. After she dressed the mannequin, the woman seductively removed another layer of clothing and dressed the next mannequin. When all five mannequins were attired, the woman wore only a scanty white leotard. The striptease took a half hour. At no time did the window dresser make eye contact with the man or the dog. But before she left the window, the woman looked upon her observers, waved, and switched off the light. The dog barked once, jumping against the window. The man snapped his finger and the dog trotted to his post at his master’s right knee. 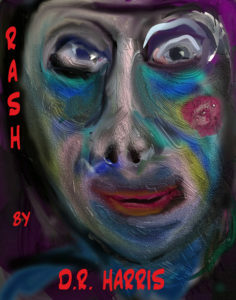 Rash, inspired by the classic Pygmalion myth, is a story of love, revenge, perversion, vanity, and the supernatural. Jack Mahler, a painter and sculptor, befriends Margaux Howland at the local gym. Margaux is in a loveless marriage with a powerful judge, Leland Howland. The judge commissions Jack to make a portrait statue of his wife. Margaux and Jack begin a love affair. When the Judge discovers the affair, he sends Margaux to their Santa Fe home. The gardener at the Santa Fe home, Carlos, is a well-regarded shaman. Observing the unhappy Margaux, Carlos uses his powers to bedevil the judge. He also gives the statue magical properties. The vanity of human behavior clashes with the power of the paranormal as the story unfolds in unexpected ways.